Here’s an idea, why don’t we use LTE Apple Watch with Android phone? Let, explain it a little how we go about this arbitrary idea. Just imagine that we have setup the Apple Watch with the iPhone. Then, replace the iPhone sim card with an Android device. Now, the possibility are that Apple Watch either going to work with the Android or will not completely recognize it. So did this idea work? Well, yeah it did but bear in mind it was not that simple enough. You can read about it in detail how we end up using LTE Apple Watch with Android. We used the new iPhone 8 Plus to setup with the Apple Watch series 3. And made it work with the Samsung Galaxy S8. Tech You Need to Use LTE Apple Watch with Android? Factory Unlocked iPhone 6 or higher. An Apple Watch Series 3. Factory Unlocked Android Phone with the microSim card slot. Carrier who supports Apple Watch Series 3. Removal tool for the sim. Begin by removing the sim card from both of the devices, iPhone and Android. Put in the Android’s sim card in the iPhone. Wait until the iPhone detects your carrier and the connection is made. Now open the Watch app from your iPhone. Next, you will have to set up your Apple Watch with the said carrier in the step 2. Finish the Apple Watch setup. Now replace the sim card from your iPhone to your Android phone. Use the Airplane mode to turn on and off on your Apple Watch. Check to see you’re connected to your carrier. Once the connection is made to your carrier from the Apple Watch, you can use your Android phone with the Apple Watch. Now, you want to sync or change the setting on your Apple Watch. You can do so by redoing the steps from 1-4. Then use the Apple Watch to set up your settings. After connecting the Apple Watch Series 3 with the Samsung Galaxy 8, we ran some tests on it. We asked Siri to call one of our colleagues, using the Apple Watch, it took Siri longer than the usual respond time but the call was connected. Then we also send an iMessage using the Apple Watch and the message went through, we had no trouble with it. 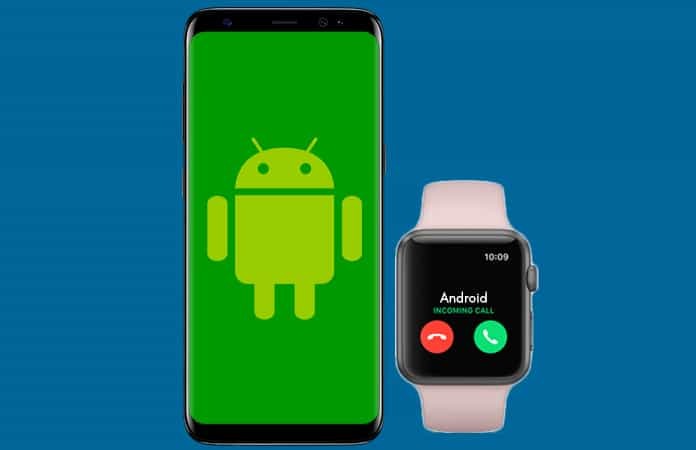 Next, we also asked one of our colleague to call us, and the call displayed on both the Samsung Galaxy 8 and Apple Watch. So we picked up the phone with the Apple Watch and had a little chat. Who can use LTE Apple Watch 3 with Android? We advise if you want to use your Apple Watch with Android, then check in your family, whether they have an iPhone or not. As you will need their iPhone to sync in other features, that you can use with the Apple Watch, like fitness, iCloud calendars and if you need to in the future change settings. Though, you can use a friend’s iPhone just to test it out. But we do not recommend it as a permanent fix. Because of security and privacy issues. Furthermore, it is not a practical or an ideal use for an Apple Watch with Android. The reason being that the Apple Watch battery will be depleted a lot faster, as the Watch will need to continuously find for the LTE connection. Let us know in the comments are you going to try out this bizarre idea and use LTE Apple Watch with Android?